I am a retired secondary teacher and unionist. I have been an Australian Labor Party member since 1972. After teaching in Victorian schools from 1975, I spent 8 years teaching in the Northern Territory: 4 in Katherine, followed by 4 in Maningrida, an aboriginal community in Arnhem Land. Returned in June 2008 to Melbourne to live after 15 months in Broome. 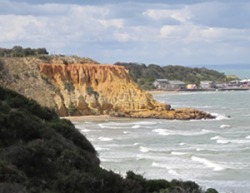 Now live near Red Bluff which overlooks Half Moon Bay on Port Phillip Bay's eastern side. The title 'Red Bluff' refers to this location, though it also reflects a bit of attitude. Red is traditionally associated with left-wing or progressive politics, not to be confused with the neck colour or Republican U.S. States where red symbolises the opposite tendency.